This text is here just in case someone might find a spoiler. I do not want to upset anyone by maybe spoiling anything. This is why this text is here. I am preventing issues. So, its the end of an era. 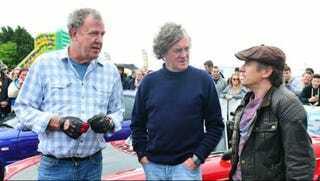 I remember the first Top Gear episode I saw. My mom actually found the show for me while looking for something to watch. It was the Winter Olympics special; right at the part where they were testing the rocket fueled Mini. Since that day in 2007, I’ve been hooked. It’s an odd feeling for me. Being 17, this show was a part of my life for nearly half of it. I grew up with it and it proved that I wasn’t crazy for my car passion. I was always able to get a great laugh. I remember actually winning one of those contests they did a few years back that scored me a DVD copy of series 10. I have a “Some Say...” Stig poster framed on my wall. So seeing and hearing it go was rather depressing. I do have to say that they did a great job ending it. That honestly was two of the best specials they have had in a long time. Unlike the more recent seasons, it seemed...natural. I genuinely laughed and felt the chemistry they had. The car choices were awesome. It was put together very well. Hammond with a beard/goatee thingy is a bit weird. James had quite the blazer on. There was clearly an elephant in the room. It just ended so.... interestingly. I don’t even know how to properly describe it. Of all ways for the show to go out though, they did an awesome job.